Not a really picky eater, anyways. I do have a thing against runny eggs and cream soda (but I am facing my fear). As far as food goes, I’ll try anything. I’m especially a fan of spicy foods. One Christmas morning, I woke up to find a jar of pickled habanero peppers in my stocking. At the time, my dad and I believed that it was the hottest chili on the planet. I was stoked to get the opportunity to try something new, so I opened the jar right up and popped a pepper in my mouth. I’m a stubborn dude. I don’t like people telling me what to do. The moment the word “don’t” comes out of a person’s mouth, I just have to challenge them. I have to. I grabbed my jar of habaneros and dug in for more. One after the other. All in front of my dad. He gave me a disapproving head shake and left the room. About two hours later, while sitting in front of the television my tune started to change. First my mouth began to water. Then my hands started to shake. Next thing I knew, I was laying on the cold tile of my bathroom floor with the worst stomach ache I had ever experienced. My dad heard me run to the bathroom, and started knocking on the door. “Are you okay?” he asked. You’d think I’d shy away from hot foods after that incident, but the truth is that I just can’t get enough of ’em. There is something about a spicy pepper that I just love. Even thinking about them makes my mouth water in anticipation. Peppers make me want to eat more food. A beer made with ghost chilis? You know about the ghost chili, don’t you? The ghost chili is one hot mo fo. One search of “Ghost Chili” on YouTube will give you tons of clips with bros bro-ing on the ghost chili, only to later admit to their bros that they can’t handle the heat. I will never eat a whole ghost chili. I am not that cool. 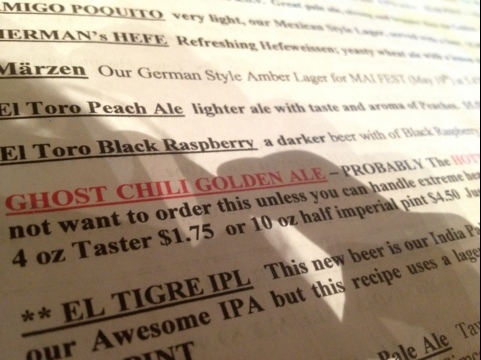 But a ghost chili beer? Color: Light gold to amber in color. Nice and fluffy, white head. Nose: Very tight and clean. A bit bread-like. Taste: Hot. I mean HOT! This beer is hot! 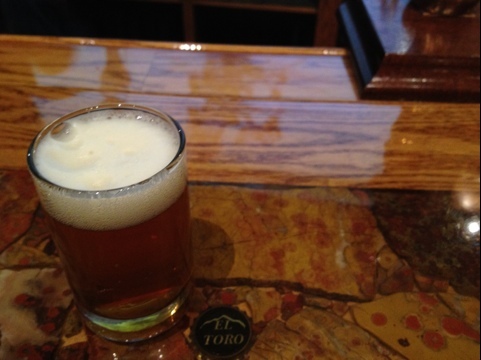 The Golden Ale, in general, is one of El Toro’s lightest beers in terms of flavor profile. Using the a lighter style of beer really allows the Ghost Chili to be the star of this beer. And a star it is. The ghost chili gives a black pepper type flavor with tons of heat. This spice is warm, and it lasts a long… long… long… time. The first sip is quite a bit of a surprise. The heat is overwhelming, but not enough to make you look like one of those bros on YouTube. Not only is this the hottest beer I’ve ever tasted, it’s the hottest THING I’ve ever tasted. Everything from my lips, to my tongue, to the back of my throat was coated with this dancing peppery spice. It took me a good 20 minutes to get about halfway through my 4 oz taster. I was about to finish it, when I thought back to that fateful Christmas morning with the pickled habaneros. I decided to leave the final 2 ounces as an offering to the beer gods. Like I was saying, when I taste peppers, I want to eat food. Next time around, I would love to try the half-imperial pint with a plate of nachos. I could also see this beer going well with a splash of V8 juice in it. Score: 4 out of 5 Bottle Caps. Feel free to take a walk with this ghost (chili). This entry was posted on March 19, 2012 at 8:02 pm and is filed under Uncategorized. You can follow any responses to this entry through the RSS 2.0 feed. You can leave a response, or trackback from your own site. I think I’ve met my match.